Author: Ineke De Moortel at the University of St Andrews. High-cadence observations have revealed an abundance of waves, oscillations, and other quasi-periodic disturbances in many solar atmospheric structures (see e.g.). Many of these observed waves and oscillations are reported to contain substantial amounts of energy, often comparable to the energy requirements of, at least, the quiet Sun corona. However, this does not automatically imply a solution to the coronal heating problem; it still remains to be demonstrated how the energy contained in these waves is absorbed by, and heats, the coronal plasma in the right place and at the right time (see e.g.). Generally speaking, the energy in the large-scale observed waves needs to be transferred to scales where individual particles can pick it up, and one possible way of doing this is to set up a turbulent cascade. Here we show CoMP observations of a large, diffuse, trans-equatorial loop and show that excess energy appears to be available in the high-frequency part of the wave spectrum, which we interpret as tentative evidence of the onset of Alfvenic turbulence near the loop apex (see  for more details). Figure 1: (A) CoMP full FOV intensity on 10 April 2012. (B) Close-up view (CoMP intensity) of the region of interest. The trans-equatorial loop is higlighted by the dashed arc. The large, off-limb coronal loops we analyse here were observed by CoMP on 10 and 11 April 2012. 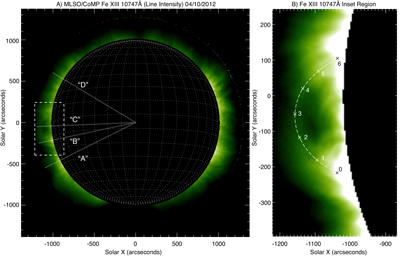 CoMP observes the off-limb solar corona from 1.05 to 1.25 solar radii. The intensity and Doppler velocities used here are based on the CoMP FeXIII coronal 1074.7 nm emission line, with 4.5 arcsec pixel size and a 30 s cadence. The data have been corrected for an east–west trend in the velocities and all frames have been co-aligned using a cross-correlation technique. The zero-point of the wavelength scale has been redefined by assuming that the mean Doppler shift over the field of view (FOV) is zero. Figure 2(A) shows a time–distance plot along the arc highlighted in Figure 1(B). There is a clear herringbone pattern visible, indicating Doppler velocity disturbances propagating up from both loop footpoints. The propagation speeds of these disturbances, estimated from the gradients of the diagonal bands (pink dashed lines), are around 500 km/s. Figure 2: (A) Time–distance plot for the time series along the arc highlighted in the middle panel of Figure 1. The pink dashed lines correspond to a propagation speed of about 500 km/s. (B) The FFT power along the loop system as a function of frequency. Figure 2(B) shows the logarithm of the fast Fourier transform (FFT) power at each point along the loop, characterising the oscillatory power as a function of oscillation frequency. For reference, the vertical white lines correspond to oscillation periods of 8 and 3 minutes. At the footpoints, power appears to be concentrated in the low-frequency part of the domain, peaking around 5 minutes (see also  & ). Almost no power is present in the higher-frequency part of the domain at the loop footpoints. At the apex, on the other hand, there is still a lot of power in the low-frequency range, but there also appears to be significant power in the high-frequency range. Figure 3(A) shows the integrated power as a function of loop length. 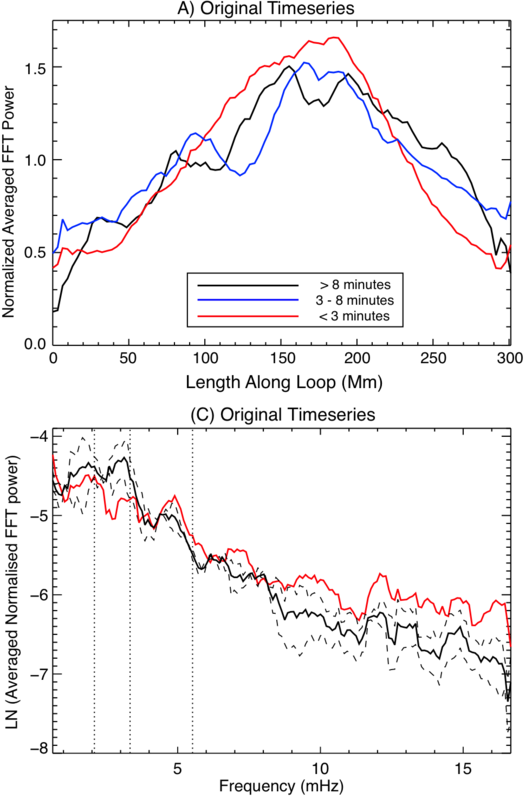 Low-frequency (LF; black) power is taken to be at periods longer than 8 minutes, medium-frequency (MF; blue) power corresponds to 3–8 minutes and high-frequency (HF; red) power to periods less than 3 minutes. To allow easy comparison of the spectral shape, each of the graphs has been normalized to its own mean. The HF power increases along the loop at a greater rate than the LF and MF power and, at the apex, clearly peaks above the LF and MF curves. Figure 3: (A) Integrated FFT power for the 10/04/2012 time series. Each of the curves has been normalized to its own mean. (C) The natural logarithm of the averaged, normalized FFT power at both footpoints (dashed black lines, solid line represents the average) and the apex (solid red line) for the original time series. For reference, the vertical lines are at periods of 3, 5, and 8 minutes. In Figure 3(C), we plot the Fourier power as a function of frequency at different parts of the loop (black dashed lines = first and last 20 grid points along the loop, red line = middle 20 grid points). The Fourier power was normalized to remove the increase in FFT power near the loop apex due to superposition and/or gravitational stratification but this does not alter the gradient of the power as a function of frequency. The gradient of the FFT power as a function of frequency at the loop apex, is clearly different from the footpoints, with different damping rates in the LF/MF and HF regimes. The normalized FFT power at the apex in the LF–MF range is less than at the footpoints but is larger than the average footpoint power in the HF range. We repeated the analysis on CoMP observations taken at the same time along simple radial cuts and found that the high FFT power in the HF part of the spectrum is only present near the apex of this loop system. This comparison gives us confidence that the high FFT power in the HF part of the spectrum is a real property of the trans-equatorial loop system rather than being caused by low signal-to-noise or other instrumental effects. In this nugget we have shown that there is an excess of high frequency oscillatory power at the apex of this system of large loops, compared to the loop footpoints. Does this agree with theoretical expectations? Numerical simulations that explain the damping of periodic Doppler shift oscillations as mode coupling, in which energy is transferred from the observed footpoint-driven transverse oscillations to an azimuthal Alfven wave in the flux tube boundary [e.g. 6,7], do predict a distinct frequency filtering effect [6-9], but such that the higher frequencies should damp fastest – exactly the opposite of what we found in the oscillations analysed here. We suggest instead that the excess power in the HF spectrum at the apex of the loop could be tentative evidence for the onset of (Alfvenic) turbulence (see also e.g. ), possibly the first step of the cascade that leads to plasma heating.